Located in Carnac in Brittany, the Domaine de Kermario is set amid the ideal surroundings for great holidays with family or friends. The site, only 3 km from the fine sand beach, serves as an excellent starting point for discovering the rest of Brittany. The camp site allows all to dive into their favourite activities. Swimming lovers can unwind at the covered pool, lagoon and paddling pool. Sports fans have at their disposal a bowls strip and football pitch. Other activities are also on offer at the camp site to fill the days with excitement for holidaymakers (in high season). For example, cinema or karaoke evenings and workshops for the little ones. 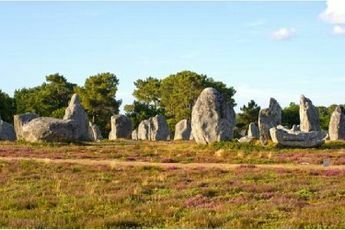 The camp site is furthermore not far from the megalithic sites of Carnac, a chance for children to discover the menhirs and dolmens. Carnac's prehistoric museum is also a place to visit. Take your children and have fun at the superb tree climbing adventure park "Forêt Adrénaline" to get your fill of thrills. Auray Train Station (15 km). Carnac is a megalithic site, famous worldwide, at the edge of the Atlantic coast. Menhirs, dolmens and tumulus, dating from the neolithic era from 5,000 to 3,000 BCE, flourish in the town and its surroundings. Nestled between the Gulf of Morbihan in the east and the penisula of Quiberon in the west, the town is shared between its old market town, its prehistoric museum and coastal resort of Carnac Beach. A veritable paradise for all lovers of the sea, Carnac is also the perfect place for all those interested in heritage sites. The St Cornély church and six chapels that surround Carnac are not to be missed. Water sports fans will waste no time in heading to the yacht club while others will go to be pampered at the mineral spring centre, one of the most renowned in France. All around Carnac, generous and luxurious nature is on offer to avid walkers. By foot, on horseback or by bike, each means of transport is perfect for exploring this exceptional megalithic site! You will come across charming little villages everywhere along your way, from Poul Fetan (53 km) to Melrand (57 km). Those who get a kick out of flora and fauna can marvel at the Odyssaum at Pont-Scorff (54 km) and the story of the wild salmon. The visit will be continued at Branféré's animal and botanical park (17 km) at Le Guérno. In Séné, don't miss the marshland nature reserve. In Bignan (40 km), Kerguéhennec château welcomes lovers of old stones. They will also have to explore the château of Suscinio, residence of Brittany's Ducs in Sarzeau.